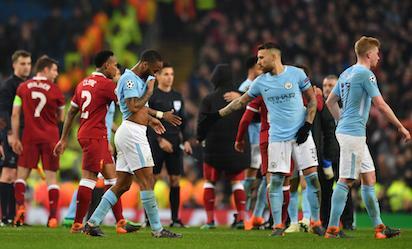 Man City Vs Liverpool : Manchester City manager Pep Guardiola blasted Spanish referee Antonio Mateu Lahoz and lamented a number of decisions that cost his side dear after a 2-1 home defeat by Liverpool on Wednesday sealed a 5-1 aggregate Champions League quarter-final win for the five-time European champions. Manchester City’s English midfielder Raheem Sterling(C) reacts following the UEFA Champions League second leg quarter-final football match between Manchester City and Liverpool, at the Etihad Stadium in Manchester, north west England on April 10, 2018. Guardiola was forced to watch the second half from the stands after being sent off for his protestations at the break as free-spending City’s dreams of conquering the Champions League for the first time were dashed for another season. City led 1-0 on the night at that stage after Gabriel Jesus’s second-minute opener, but the hosts felt aggrieved after Leroy Sane had a second goal wrongly disallowed for offside just before half-time. “It’s different to go in 1-0 at half-time to 2-0,” said Guardiola, who also believed Liverpool’s opener in a 3-0 first-leg win at Anfield last week should have been ruled out for offside. Mohamaed Salah booked Liverpool’s place in the last four for the first time in a decade when he coolly chipped home his 39th goal of the season 11 minutes into the second half before Roberto Firmino inflicted a third consecutive defeat on City for the first time in Guardiola’s near two-year reign. Liverpool manager Jurgen Klopp hailed the maturity of his side to see out a first-half onslaught. “The boys found a solution. We had these two or three moments already at end of the first half so it was easy for me and the boys to see the development of the game and that we are already through the whirlwind,” said Klopp. Liverpool trail City by 17 points in the Premier League, but have now beaten Guardiola’s men in three of their four meetings this season. “I really think they are the best team in the world at the moment but I knew we could beat them,” added Klopp. Guardiola admitted beforehand that his side needed the “perfect” performance and the hosts got the perfect start as they opened the scoring after just 117 seconds. Liverpool were unhappy at Mateu Lahoz in what was to be the start of a controversial night for the Spaniard when Virgil van Dijk claimed he had been pushed by Raheem Sterling in the lead-up to the goal. The referee was unmoved, though, and with the Dutchman out of position, Fernandinho’s through ball found Sterling and his low cross was swept home by Jesus. Salah had been an injury doubt after limping off in the first leg, but Liverpool were unable to spring the Egyptian free in the first 45 minutes as City peppered the visitors’ box with crosses without finding the final touch. Bernardo Silva saw a deflected effort spin just wide and then rattled the post with a deflected long-range strike. The turning point came seconds later when Sane turned into an empty net after Loris Karius’s punch came back off his own player James Milner. Guardiola ran onto the field at half-time to pull his protesting players away from the official before embarking on his own rant at Mateu Lahoz that saw him watch the second half from the stands. City understandably failed to maintain the intensity of their first-half display and Salah got the decisive goal when he followed up after Ederson had denied Sadio Mane with a wonderfully-judged chipped finish past the despairing Nicolas Otamendi in the 56th minute. City’s terrible week after also blowing the chance to seal the Premier League title against local rivals Manchester United at the weekend was rounded off 13 minutes from time when Otamendi was caught in possession and Firmino slotted in off the far post. The post Man City Vs Liverpool : How Salah send Liverpool into Champions League semi-finals appeared first on Vanguard News.